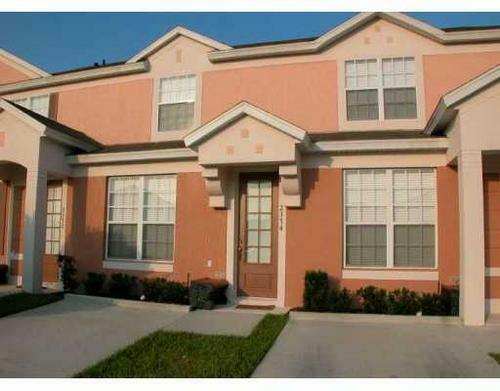 Vacation Rental or Holiday Apartment in Kissimmee, Florida, United States. Late Deals, Special Offers. Windsor Palms 3 bedroom 3 bath Townhouse - 5 Star Resort. Vacation rental. This Great Resort is located only 4 miles from Disney. Our lovely 3 bedroom / 3 bath townhouse has lots of great ammenities, Cable TV, Microwave, Dishwasher, etc. Resort ammenities include olympic size heated pool, hot tub, exercise room, game room, basketball courts, volley ball, tennis, even a movie theater. You also have shuttle service to the theme parks for a small fee. Our townhouse features a king size bed in the master bedroom, private spa, complete kitchen, cable TV in all bedrooms, Ceramic Tile throughout for cleanliness. This is a beautiful resort. Our townhouse has the rear facing a conservation area for added quiet. There are at least 4 golfcourses within 10 minutes drive. All this and only 4 miles from Disney. Shuttle bus service from the resort to the major theme parks for a small fee. The marker is only a general indicator of the property location. Confirm with owner for more details. Price Includes:-Your one week stay in our townhouse for up to 6 people, including taxes. There are no extra fees. Other Information:-Please contact us for last minute discounts or for pricing on longer stays, we give discounts for longer stays. This property has a calendar full availability on another site. Click on the calendar logo to view it.